The British agricultural revolution of the 18th century was responsible for the most defining change in the way farmland was managed, and the way grains like wheat and barley were grown and harvested. During this time, the older style of subsistence farming practised for hundreds of years was replaced because enclosures had taken the common land away from the rural poor – every little hamlet formerly had open spaces, where the cottager could pasture a few beasts; locally 806 acres of commons and waste were allotted into private ownership. [i] The rural social structure at the time graduated from labourer, working for somebody else, to husbandman who worked his leased farm, to freeholder, or yeoman, who owned his farm. In the towns there were shop assistants and businessmen, where to be middle class one had to have at least one servant. A gentleman had independent means, and the lords of the manor were mainly aristocracy. In the late 17th and early 18th centuries, wheat was still milled close to where it was grown, white bread was predominantly the food of the rich and the city dwellers, and wholemeal the food of the poor and the country households, where both rye and barley were still commonly eaten. A succession of poor wheat harvests after 1770, together with a rapidly rising population, led merchants to import grain from Europe; so, the management of mills started to pass from the Lord of the Manor to the merchant in the nearest market, thus losing their tie with the local community. Sheffield has always been fortunate in having a choice of stone suitable both for building and turning into grinding stones for cutlery and milling corn. Perhaps the largest quarry near here, was at the crest of Psalter Lane shown in the picture above and on the map, below( just to the left of the letter L in Lord Murray); it dates from at least 1520 and in 1672 was let out for grindstones by the lord of the manor for 13s. 6d. per annum. [ii] The hollow created was later occupied by the Bluecoat school, and after World War two by the College of Art till 2008, which then moved into Hallam University buildings in town. 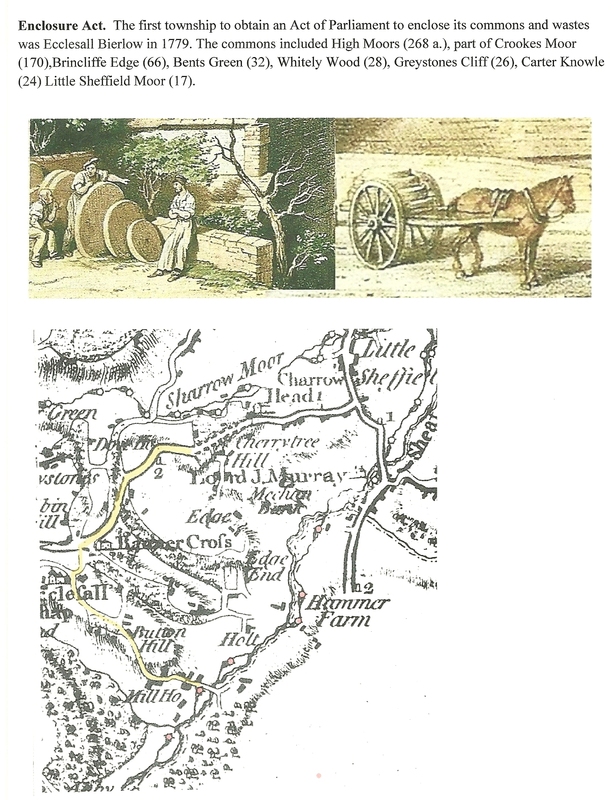 It is probable that this is where our millstones came from; the route they would have taken is coloured in on the map below. [i] Details of the larger units are shown below.